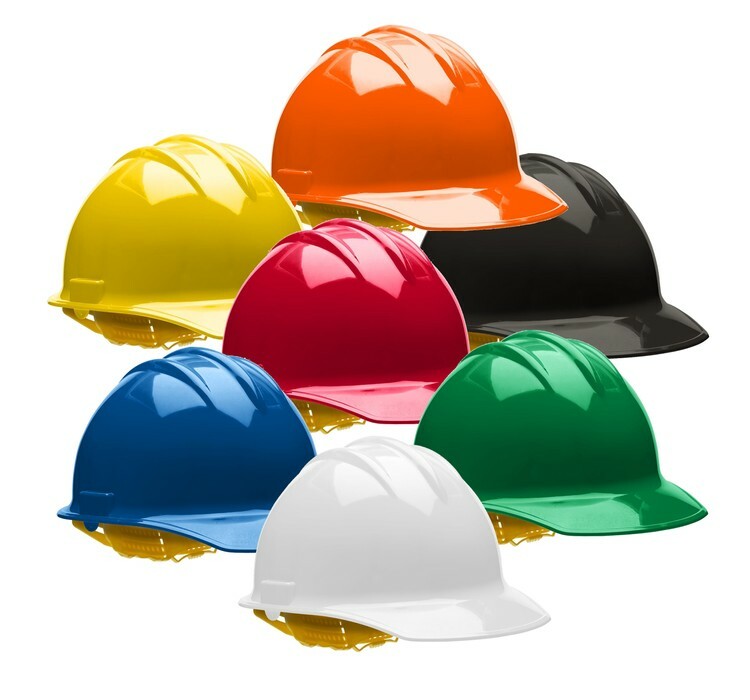 Real full brim hard hat meets or exceeds OSHA ANSI Z89.1-2009 Type 1 Class E,G and C. Perfect for ground-breaking, construction site, job site or anywhere a real hard hat is needed. 6-point slide-lock suspension assembly. Ratchet assemblies also available at additional cost. 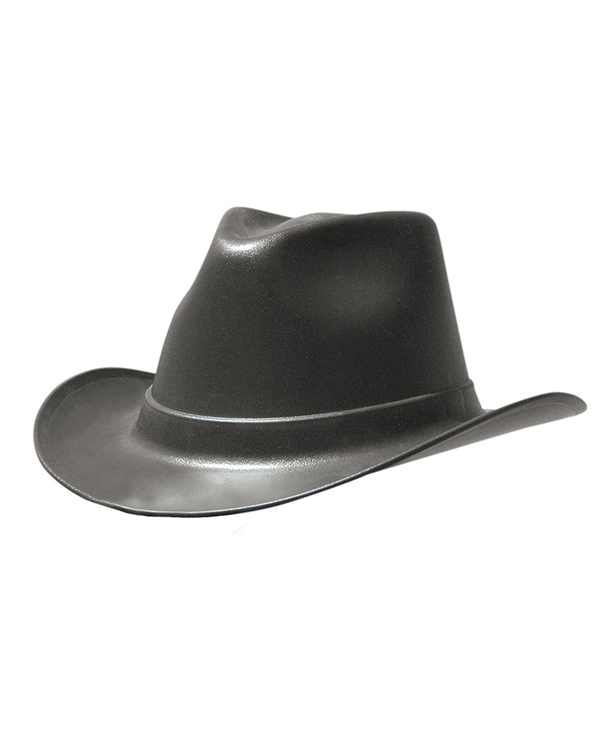 Imprint is pad-printed directly on the hat. Made in the USA. Model HH-1. 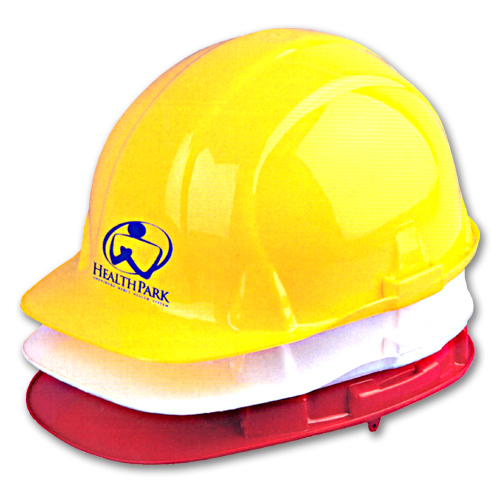 is a real hard hat with OSHA approval. 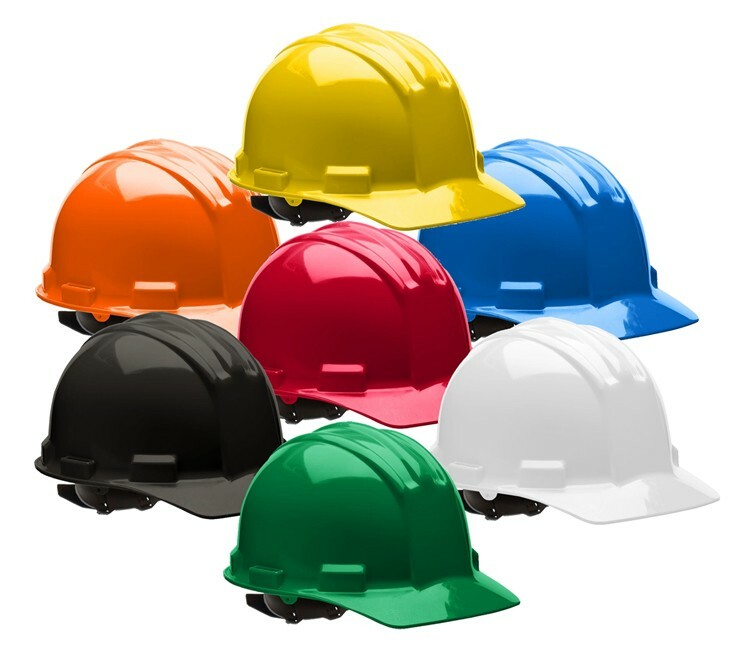 Perfect for the job site, groundbreaking, and just about anywhere a hard hat is needed. 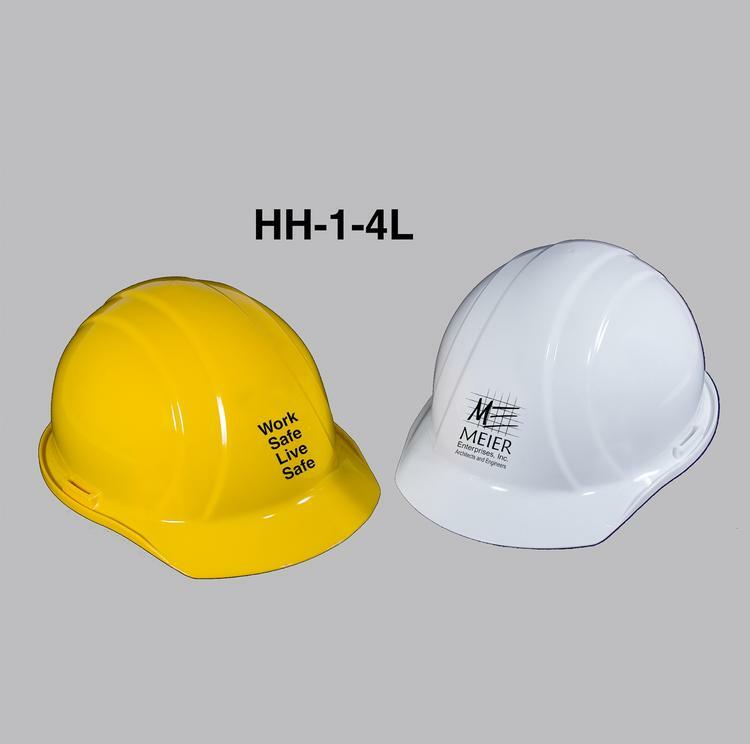 The Model #HH-1 is a Type 1 hard hat with 6 point suspension, adjustable headband, and meets or exceeds ANSI Z89.1-2009, Class E, G and C.
Model HH-1-4L is a real hard hat with OSHA approval. 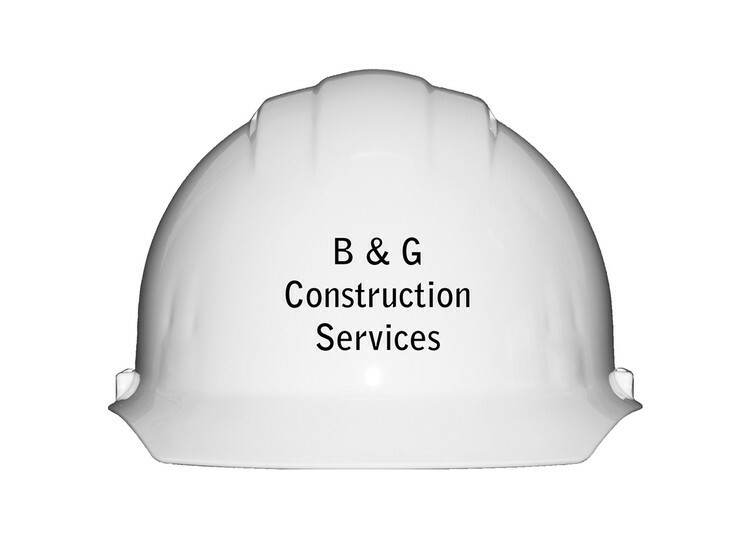 Perfect for the job site, groundbreaking, and just about anywhere a hard hat is needed. 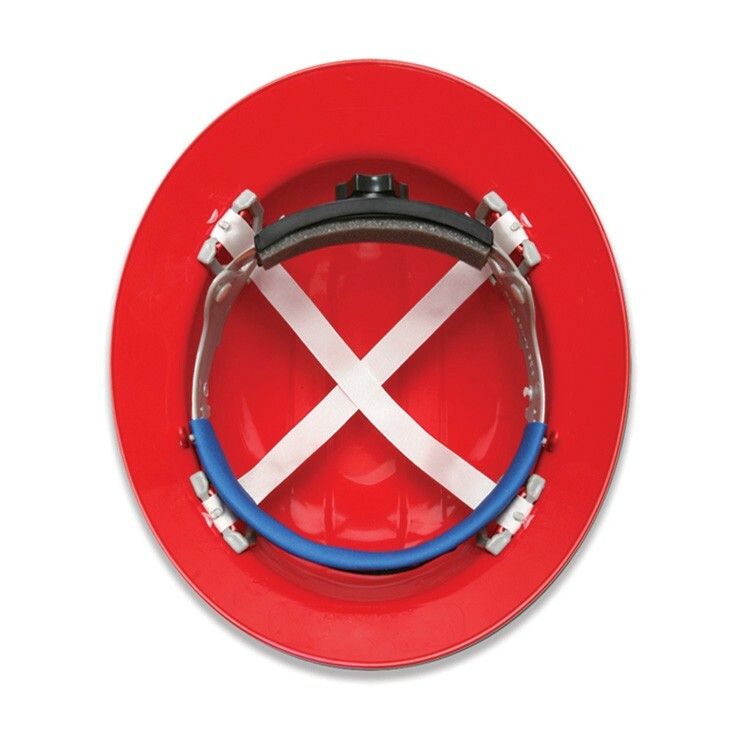 The Model #HH-1 is a Type 1 hard hat with 4 point suspension, adjustable headband, and meets or exceeds ANSI Z89.1-2009, Class E, G and C.
Secure-Fit Ratchet Replacement Suspension. 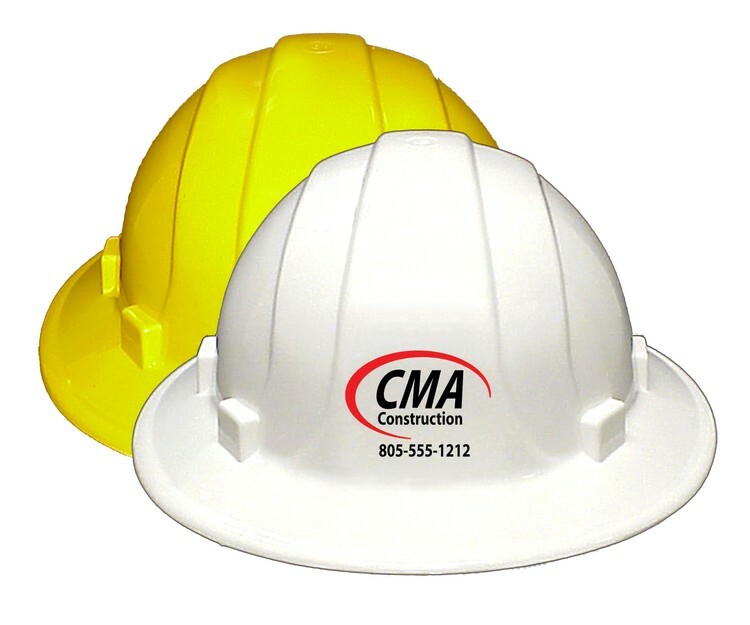 Fits Americana Full Brim Safety Hat. 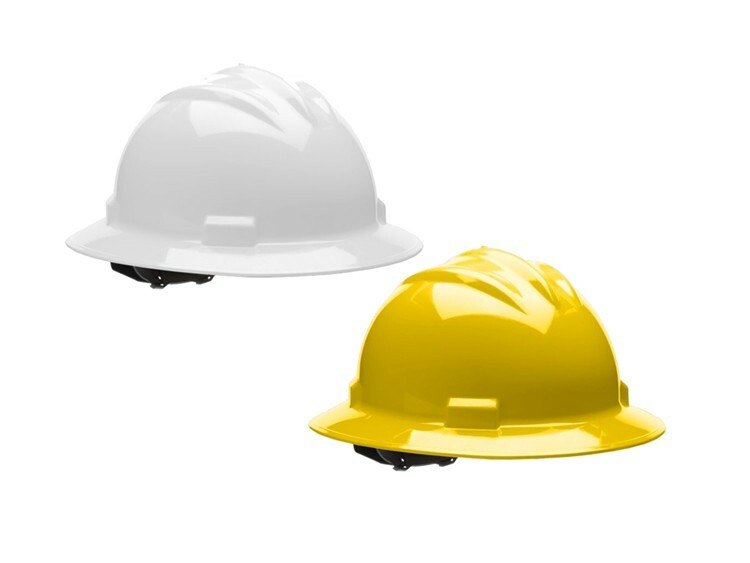 Features easy turn knob; adjusts from head sizes 6 1/2 -8. Comfortable impact-absorbing 4-point woven nylon suspension. 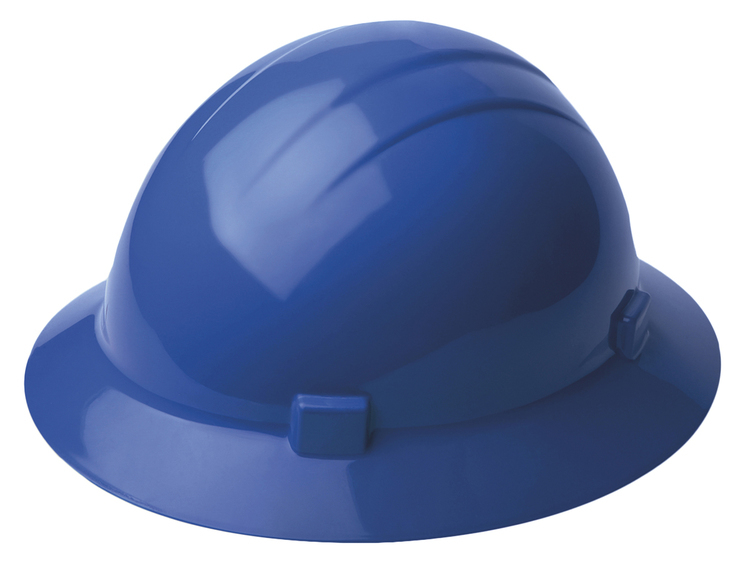 Pyramex Ridgeline full-brim hard hat with Graphite finish. OSHA approved. Must be ordered in even cases of 12 hats. 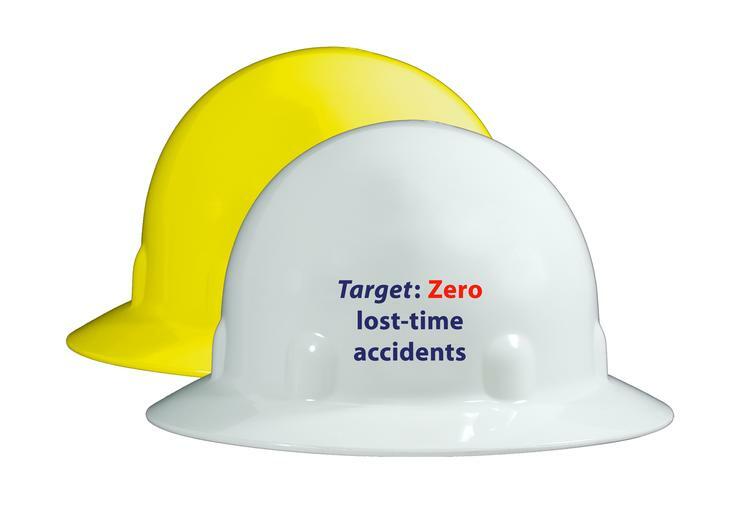 Meets or exceeds the requirements for a Type 1 helmet (Top impact) as outlined in ANSI Z89.1 Class E & G. Fits size 6 1/2 to 8. (Not designed to protect against lateral blows from the front, sides or rear.) 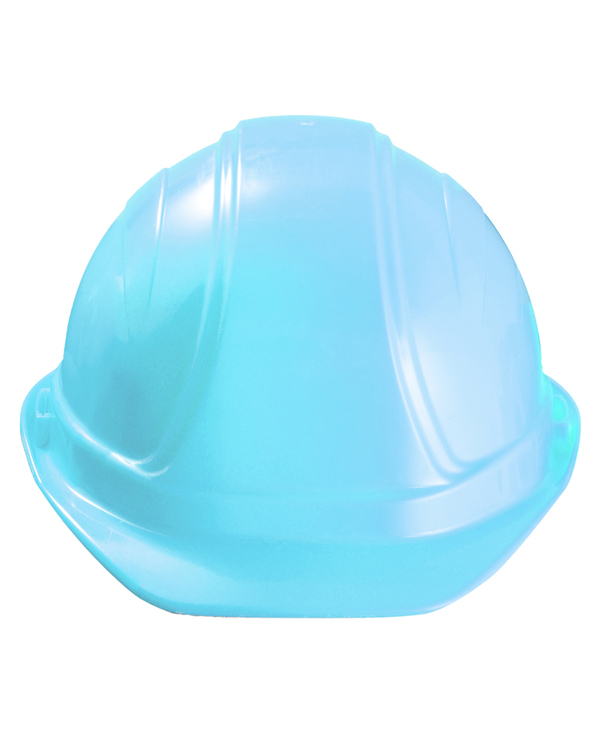 Shell-high-density polyethylene. Suspension-various. Ink prints directly on the hat, no labels or decals. Made in the Taiwan and printed in the USA. 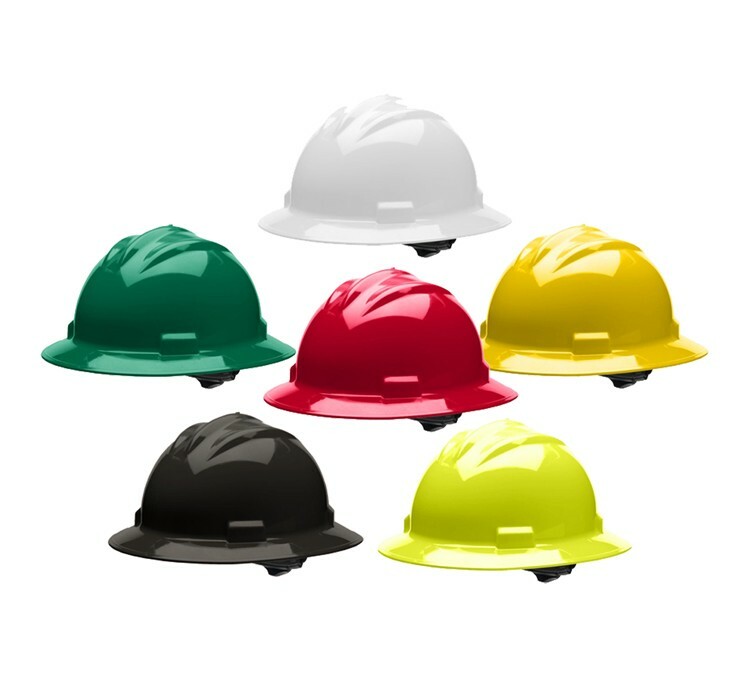 HH-1-4AV OSHA approved vented Cap-style Hard Hat with a 4-point standard suspension. The vents keep the wearer's head as much as 10 degrees cooler. 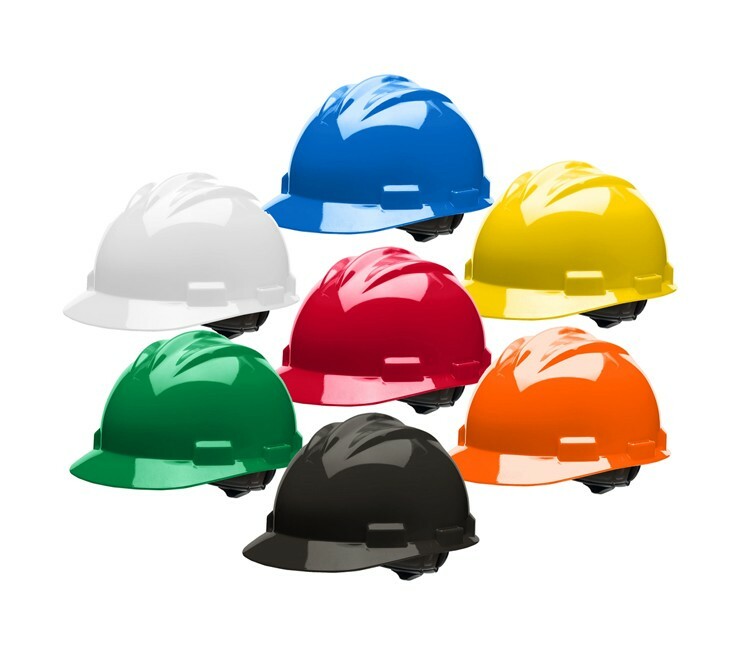 Meets or exceeds the requirements for a Type 1 helmet (Top impact) as required by ANSI Z89.1-2003 Class C. Fits head sizes 6 1/2 to 8. Ink prints directly on the hat, no labels or decals. Made in the USA. Secure-Fit Ratchet Replacement Suspension. 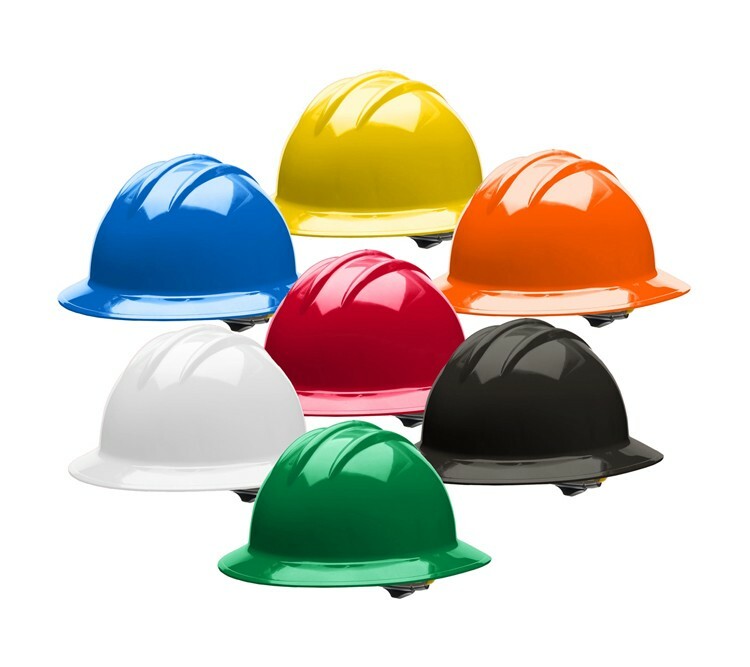 Fits Omega II and Omega Full Brim Safety Helmets Features easy turn knob; adjusts from head sizes 6 1/2 -8. Comfortable impact-absorbing 6-point woven nylon suspension. 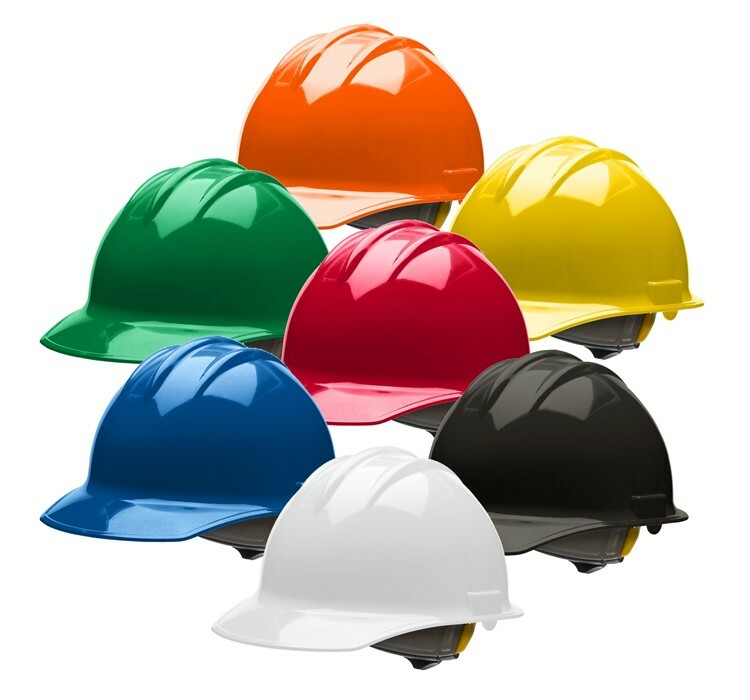 Brim around entire helmet helps keep rain, sun, construction accident off users neck and ears. 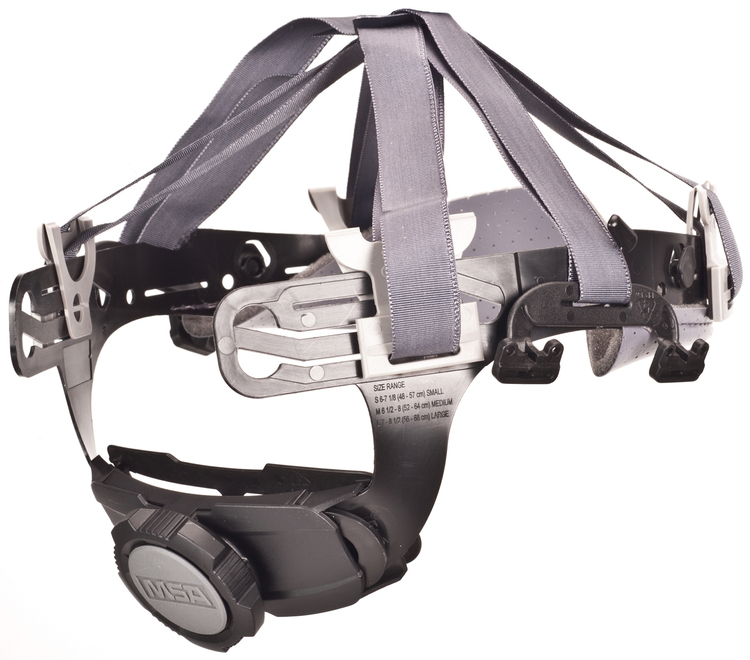 Ratchet suspension adjusts size quickly and easily.Nylon crown suspension straps fit comfortably. 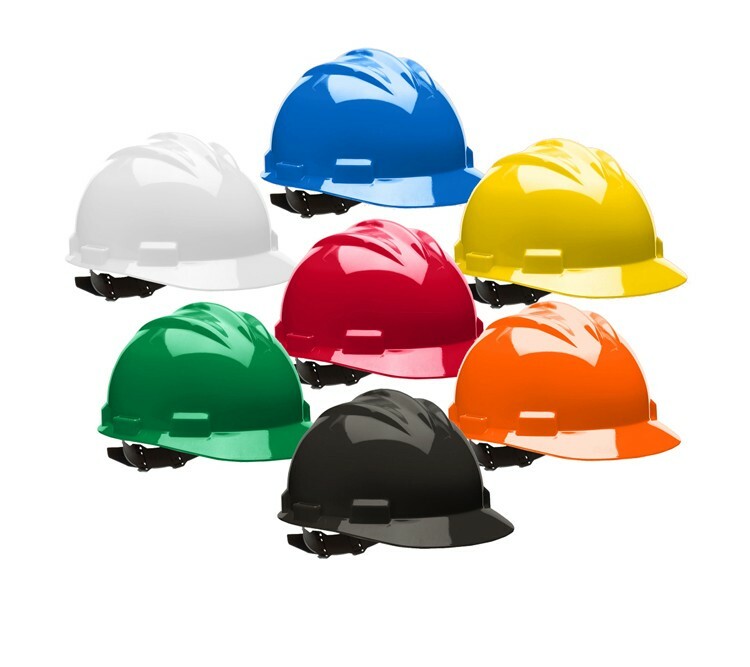 Lightweight and balanced for all day wear.Color can be customed when your need more than 500 pcs. 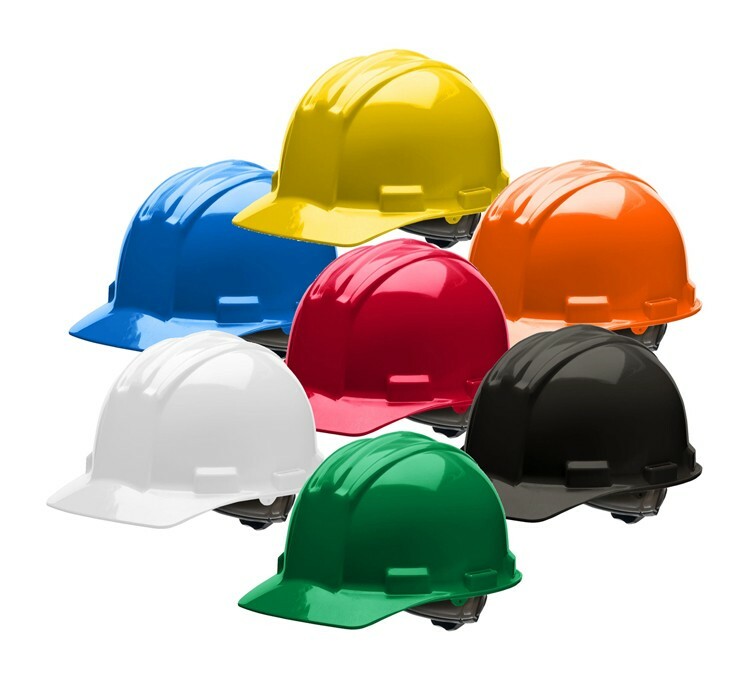 Construction hats with other design are also available. Welcome inquiry! 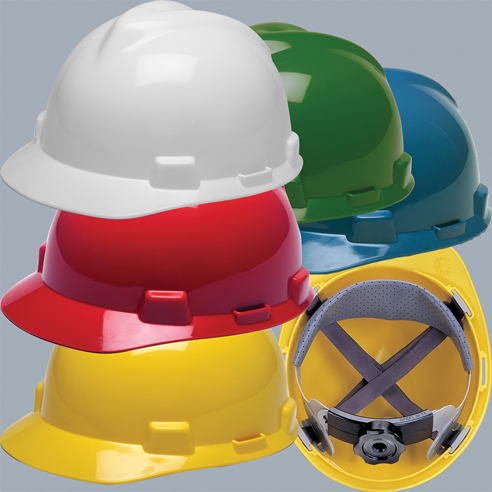 Full-brim hard hat molded from high density polyethylene. 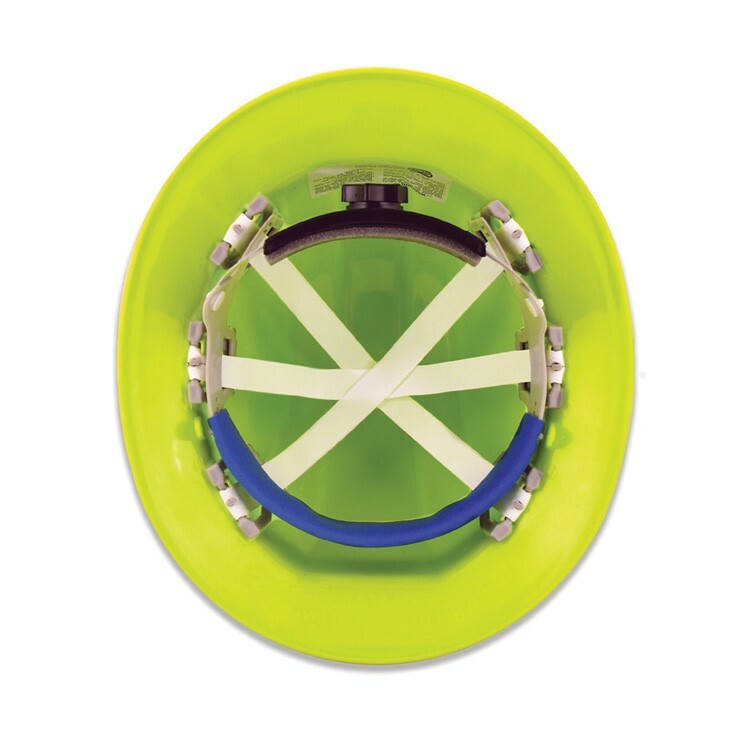 Protects wearer from lateral blows to front, back and sides in addition to top of head. Secure-Fit ratchet adjusts to head sizes, 6 1/2 - 8. Four-point nylon suspension. 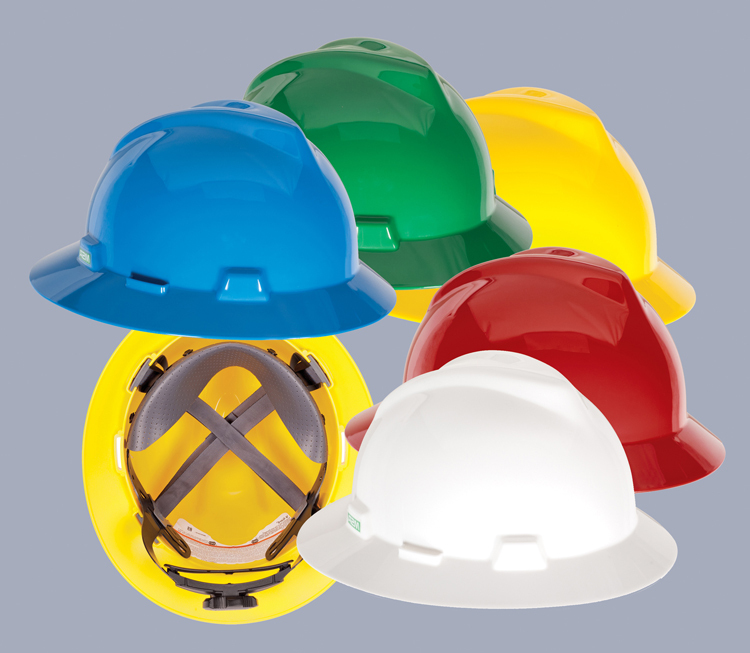 Meets ANSI Z89.1, Type 2, Class C, E & G requirements. 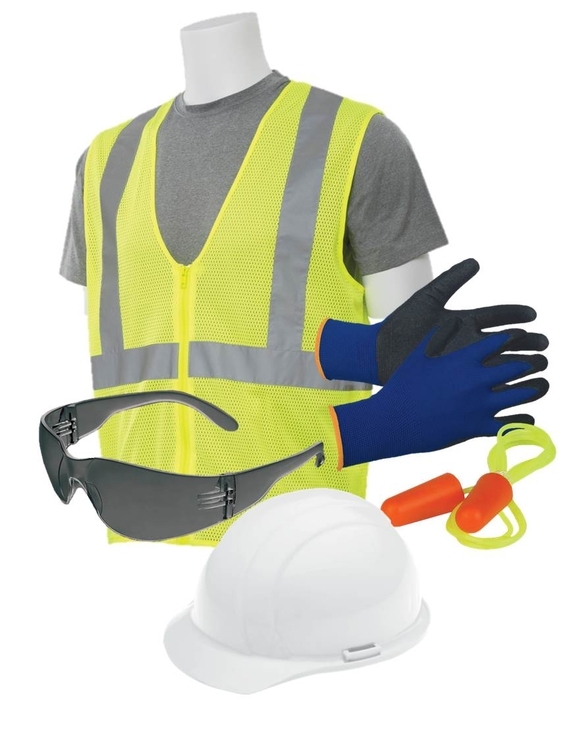 Kit contains Liberty White ratchet suspension hard hat, IProtect Clear Safety Glasses, Nitrile Coated Gloves, Corded Earplugs, Lime XL Safety Vest.  Replacement FasTrac ratchet suspension for the MSA-4R and the MSA-4FR. OSHA approved. 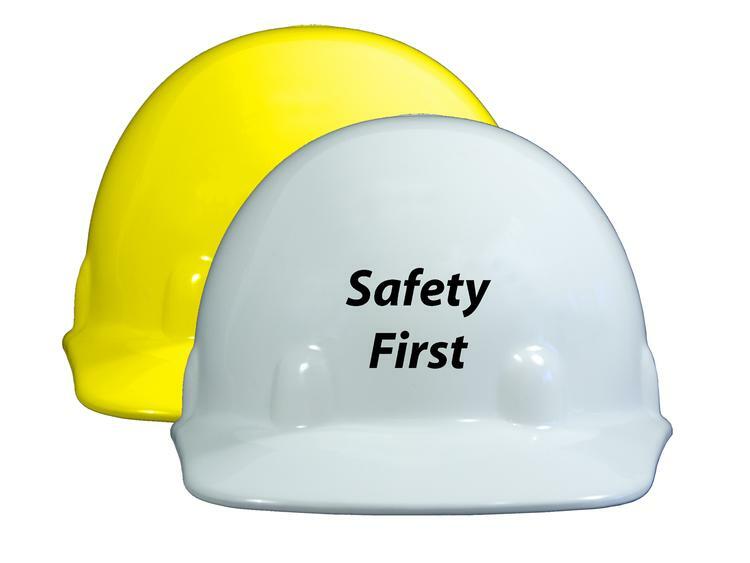 OSHA regulations suggest replacing the suspension every year (Hats every 5 years or sooner if damaged) If companies don't replace the suspensions every year, they could have significant legal liability. 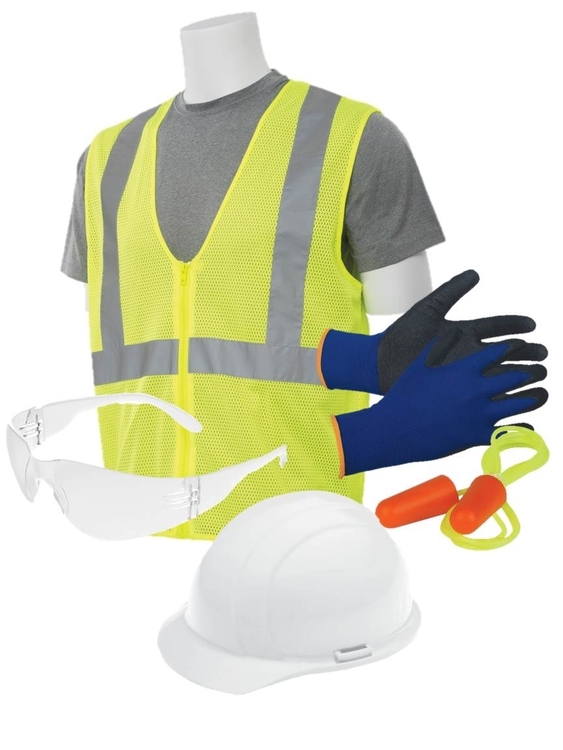 Kit contains Liberty White ratchet suspension hard hat, IProtect Smoke Safety Glasses, Nitrile Coated Gloves, Corded Earplugs, Lime 2X Safety Vest. NEW! 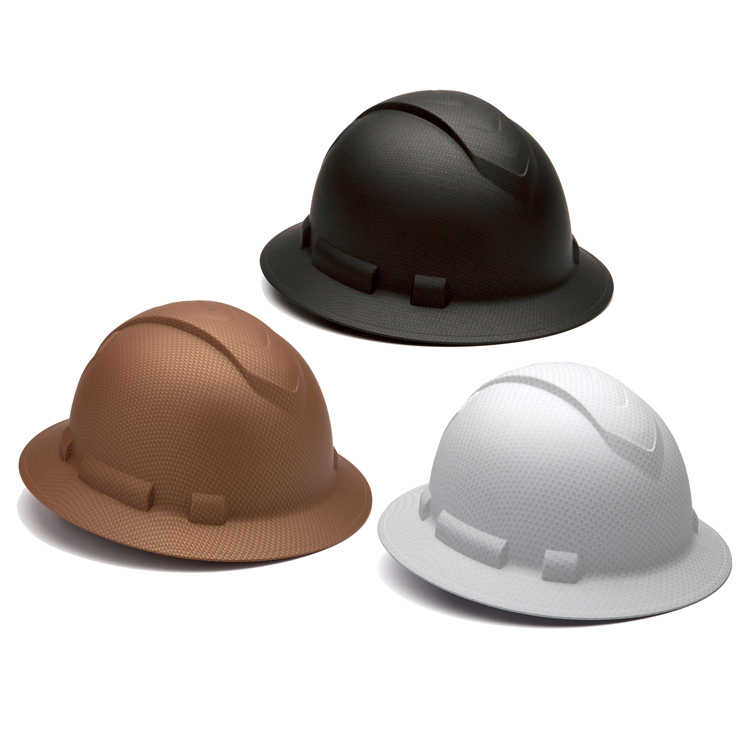 Please welcome the newest addition to the Americana line of hard hats - the Americana Full Brim with Accessory Slots. Made form HDPE. Comes with a either Ratchet or Standard Suspension. Made in USA Meets. ANSI Z89.1 Type 1 Class C, E & G.